Papas con rajas tacos get me every time. I mean, how does something so simple contain so much flavor?! Papas translates as potatoes, and rajas refers to the strips of roasted poblano peppers which are sautéed with onion. Together they are the most satisfying pair. I’m so enamored of this accidentally vegan* Mexican dish. Slightly spicy from the poblanos, seared onion, and soft and creamy potatoes. 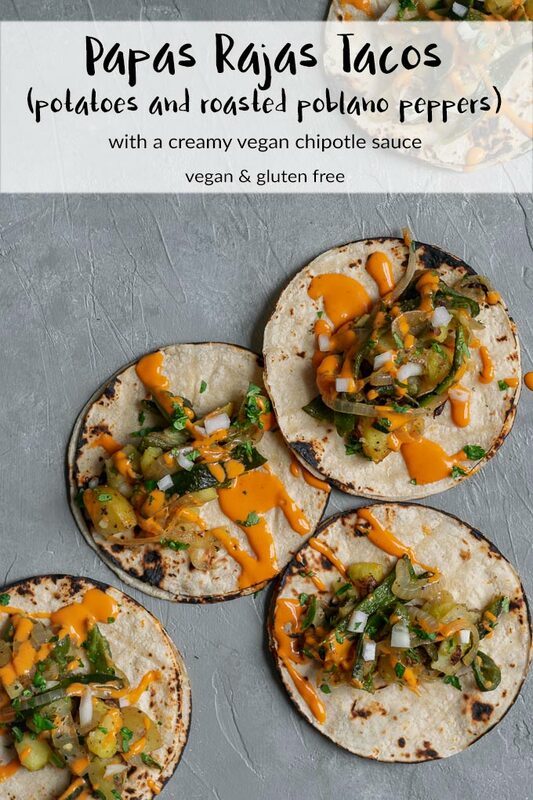 Top it with a drizzle of my creamy Mexican chipotle sauce with aquafaba, a scoop of homemade spicy roasted tomato salsa, hot sauce (I have an easy homemade hot sauce too! ), or vegan sour cream, and you’ve entered food heaven. And also possibly carb heaven. *Now, I say accidentally vegan, but if you ever encounter this dish out inquire about lard. This recipe is so easy to make and perfect for leftovers as the filling reheats really well! First, dice up and boil the potatoes until they’re just tender. While that’s happening, roast the poblanos. I love to roast over the flames of my gas stove, but under the broiler of an oven works well too. Once the poblanos are burnt and blackened all over, move them into a large bowl/a paper bag/ziplock bag, something that you can seal up or cover and let the chiles steam. This softens the peppers a bit and also loosens the blistered skin so it can be easily peeled off. While the poblanos are steaming away, pan fry the onions until they soften and start to get some color. Peel, de-seed, and slice up your poblano chiles into strips and add them along with a little minced garlic and Mexican oregano. If you can’t find Mexican oregano and don’t want to order it online, you can use the more ubiquitous Mediterranean oregano. Fry those a bit, then add the cooked potatoes (and the salt! and pepper!). Since the potatoes are already cooked, this is just to give them some color and bring everything together. Just stir once or twice over a few minutes then turn off the heat. 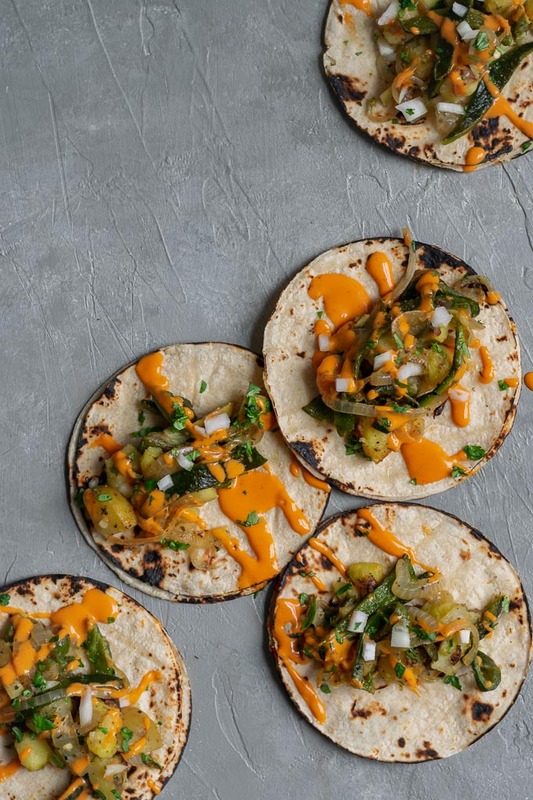 To serve, heat up your corn tortillas, layer them two deep because you know what’s up, and scoop in some of the warm papas con rajas. Drizzle a little creamy Mexican chipotle sauce on top and take a bite. Realize you didn’t add enough sauce because it’s too darn good and go back for another more generous drizzle–what, just me?? This recipe is enjoyed by everyone–vegans, non-vegans, people who need or want to eat gluten free… I mean, what’s not to love? We have potatoes, roasted poblanos perfectly charred alongside onion. I suppose I have met one or two onion haters in my life, for them you can leave out the onion. Rajas on their own are a great spicy taco topping or burrito filling. But my favorite way to eat them is definitely with potatoes! 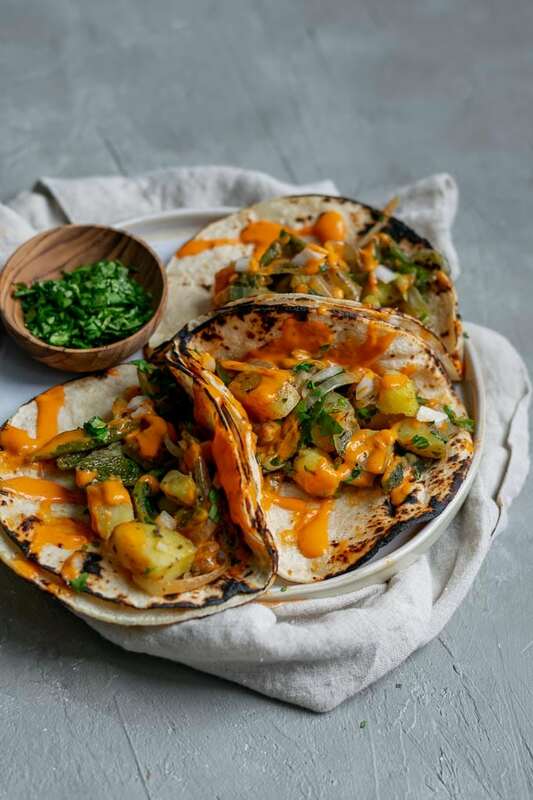 These potato and roasted poblano tacos are just so flavorful and delicious! If you’re someone who needs a side of beans and rice with your tacos, you should think about making my Mexican Pinto Beans and Tomatillo Cilantro Lime Rice. It’s one of my top meals on it’s own, add some papas con rajas tacos and I don’t think I could get any happier! And if you’re thinking ahead to colder days, or someone who enjoys a spicy soup year round, well you should definitely whip up a pot of this Seared Seitan and Mushroom Pozole Rojo too. I think I’ve just planned your next dinner party to have a Mexican theme! You’re welcome. Just need to develop a tres leches cake for dessert 😉 ! I do hope you give these delicious tacos a chance, they’re perfect for Taco Tuesday, or a fun Friday night dinner. I’m always sad when we finish up a batch of the papas con rajas cause they’re that good! 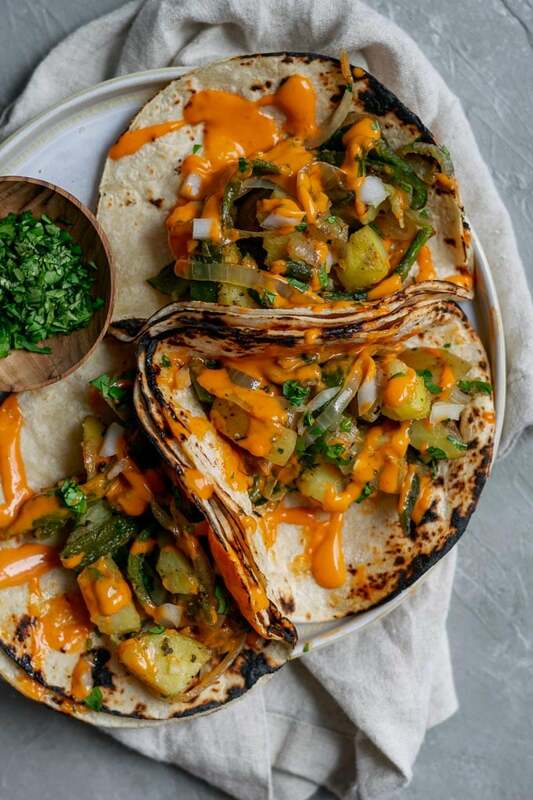 Well, if you make this papas con rajas tacos recipe, leave a comment and rate the recipe below! And tag your recreations @thecuriouschickpea and #thecuriouschickpea on Instagram, I love seeing your photos! Want it a bit milder? Substitute 1 bell pepper for 2 poblanos, or use all bell peppers. Still roast them and prepare them the same way! 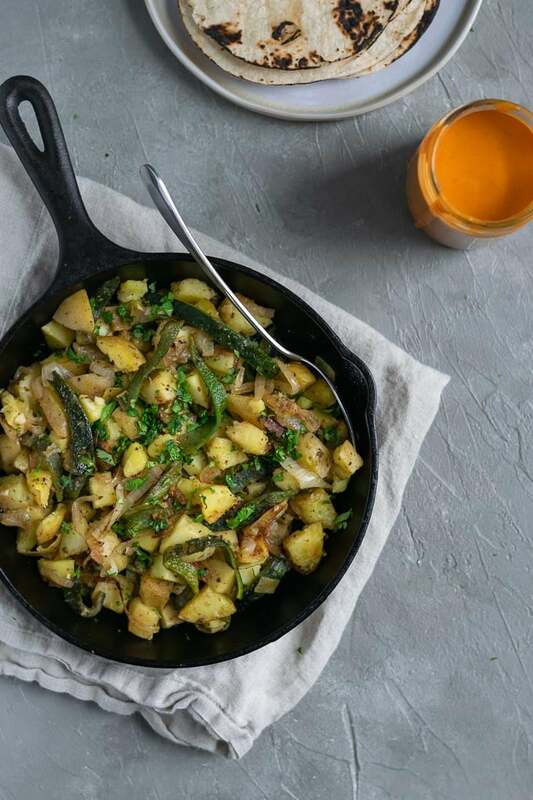 Papas con rajas are tender potatoes with pan fried roasted poblanos and onion. They make a delicious vegan and gluten free taco filling. 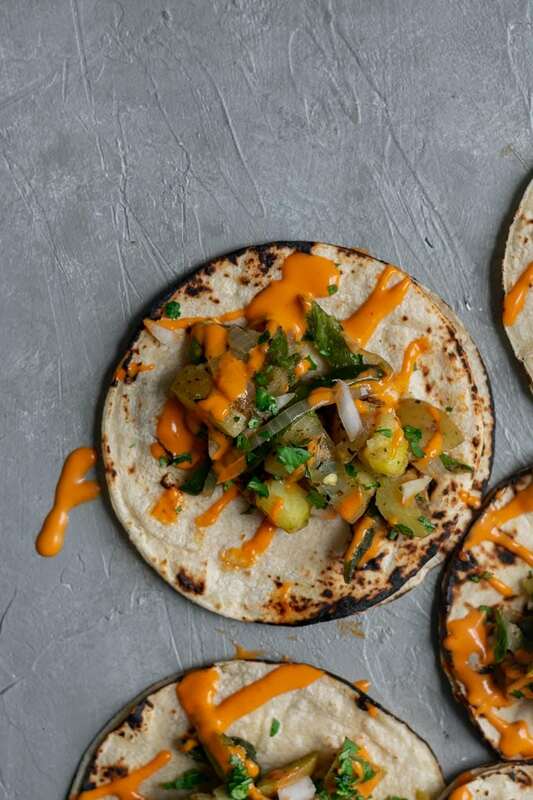 Topped with a Mexican chipotle sauce, these tacos are out of this world delicious! Roast the poblanos over the flames of a gas stove or under the broiler, turning occasionally, until the skin is blackened and burnt all over. Put the peppers in a bowl and cover. Set aside for several minutes until cool enough to handle. The steam will loosen their skin, peel the poblanos, remove the stem and seeds, and slice into thin strips. Set aside. Meanwhile, place the potatoes in a pot and cover with water. Cover and bring to a boil, lower the heat to a simmer to cook until the potatoes are easily pierced with a fork, about 5-8 minutes. Drain and set aside. In a large skillet over medium heat add 1 tablespoon of oil. Add the onions and a pinch of salt and sauté for 5-7 minutes until they start to soften and turn a golden color. Add the roasted poblano strips, minced garlic, the oregano, a pinch of salt, and black pepper. Sauté for another 3-4 minutes. Add the remaining 1 tbsp of oil and the cooked potatoes to the skillet along with 1 teaspoon of salt, and fry for about 5 minutes, only stirring once or twice so the potatoes can brown. 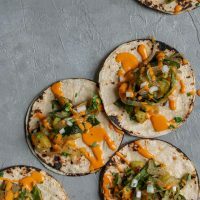 Serve on warmed corn tortillas with a drizzle of creamy Mexican chipotle sauce and minced cilantro and onion (if desired).